Amy Gibson | What is ML Reading? Last week, I focused on non-fiction books about onomatopoeia. This post recommends three perfect examples of onomatopoeia used creatively. 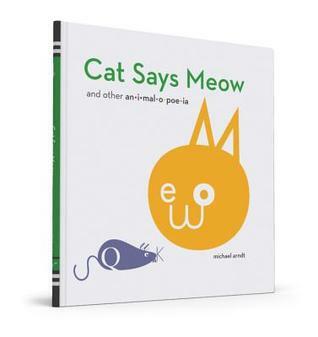 Cat Says Meow and other an-i-mal-o-poe-ia by Michael Arndt – ML has outgrown most books composed mainly of animal sounds, but this one has an added twist. The graphically designed animals hide the letters to the sounds they make in the illustrations using a variety of fonts. We couldn’t pick a favorite illustration because they are all clever. oochy, sploochy, woochy, woosh and ker-plop! The illustrations evoke the joy of a day spent playing in the rain and mud. Ending with a much needed bath. 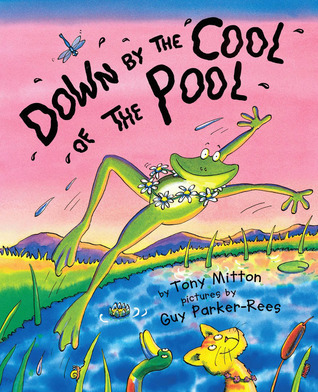 Down By The Cool Of The Pool by Tony Mitton and illustrated by Guy Parker-Rees – One of my go to read-alouds when the story time crowd includes people age 1 day to 104 years-old. No one can resist impersonating a frog that says “Wheeeee! Can you dance like me?” If the babies in the audience are “Wah wah wahing” instead of shouting “Wheeee!”… no one cares because everyone’s having a great time. The bright, colorful illustrations of smiling, dancing animals add to the fun.